Raw Material: Virgin wood pulp(NBKP/LBKP), Straw pulp, Deinking pulp, bamboo pulp and bagasse pulp . Pressure net vat, stainless steel cylinder mould forming system . Square wimble pipe for pulp entering system . High line pressure touch roll by air controlling dewater system . Compound breathing hot wind system . Compound air controlling creping doctor system . 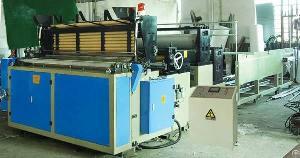 Air automatic control guider and electric stretcher for felt . Company Name: Hengbon Industrial Co., Ltd.